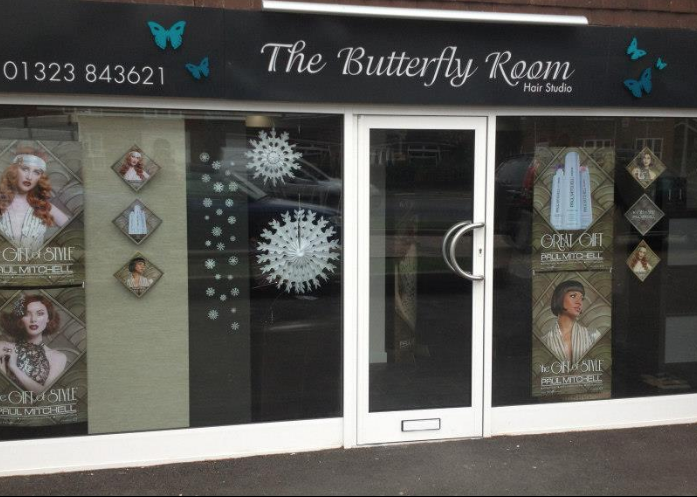 The hairdressers at The Butterfly Room guarantee to give you beautiful hair that will make you look and feel great. The Butterfly Room offers an indulgent, high end experience with a team of hairdressers ranging from Graduate Stylists through to Senior Hair Consultants. We have over 150 reviews to date on Salon Spy. As well as hairdressing we also provide a range of luxury nail and beauty treatments for the ultimate indulgence. You can view our price list and opening times. Our stylish salon is located on the outskirts of Hailsham and has free on site parking. Call us to book an appointment today. What a really helpful salon. On my way to work and felt I needed a quick pick me up trim. And while that’s never ideal for a busy salon they were really accommodating. And it was a great cut as well! Caitlin was brilliant, I can be fussy as like my thick hair as flat and straight as possible. I have been going to the butterfly room for a year now and despite having highlights my hair is in the best condition ever! Friendly and very welcoming always. Becky has always achieved what I hoped for and more! Can’t thank her enough. Thrilled to bits. Five months since I had been to hairdressers because of four moves.......and just so pleased with result. Exactly what I wanted . Visited this salon for the first time today and saw Emily! Wow what a brilliant place! The salon itself is lovely, nicely decorated and such a warm and welcoming atmosphere. Emily did my hair and she is amazing, I had a full head of highlights and a cut and blowdry and for the first time in a long while I have found someone who listens to what their customer wants! She was very professional, very talented, kind and friendly and my hair turned out exactly how I wanted it and am over the moon with it. I also had a complimentary head, neck nd shoulder massage which was so lovely. The coffee is fab too ;-). It’s not cheap but I strongly believe you do get what you pay for and I have already booked my next appointment. I thoroughly recommend The Butterfly Room!! Amazing - you won’t regret going to The Butterfly Room! Can’t recommend high enough - very personal and relaxing experience. The stylists always listen to clients and treat them amazingly - it’s a wonderful atmosphere and experience. I have genuinely never left the salon disappointed! As always- an excellent experience- both professional and friendly. Would thoroughly recommend it! Emily cut my hair this morning and she has done it so nicely!! So so happy with the results and I felt as if she really listened to what I wanted/didn’t want! Thankyou for I received my prize I entered and was not dissapointed at all, lovely experience and 3 hours of total relaxation, I'm really happy with my colour and would highly recommend the butterfly room. Thankyou ???? Just seen Emily, as usual she did just what I asked. Cut is great. Thank you Emily. Love this salon. The staff are all so friendly and easy to chat to to discuss your hair ideas. Love coming here, always looked after so well and my hair looks great! First visit to the salon and very happy with my eyebrow wax, have booked again.